Crypto-Loot is the PUP that uses misleading techniques to prevent removal. Use Reimage to locate malicious components and get rid of them faster than with uninstall instructions. A full system scan blocks virus reappearance and prevents traffic to malicious domains. Crypto-Loot can be bound to fake websites. Hackers can create legitimate-looking websites and infect them with crypto-mining malware. 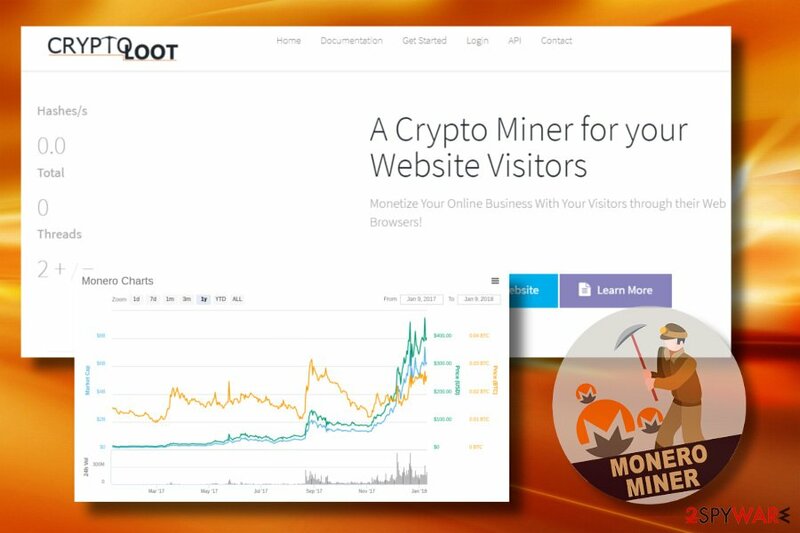 Such websites may render multiple JavaScrips, one for mining Monero or another currency and the other for locking web browser's screen to prolong the visit time and maximize the profit. Crooks can inject Crypto-Loot into legitimate apps and web browser's extensions. If the PC's user installs such application, the CPU and GPU resource consumption will continuously exceed 50%, thus severely diminishing PC's performance. Crypto-Loot virus is multi-platform utility compatible with Window, Linux, and iOS. Besides, it can run on desktop PCs, laptops, tablets, and smartphones. If you are a website's owner and seek to use it for monetization purposes legally, you can do that by signing to the service for free. If, however, your antivirus software keeps reporting you about a stealthy attempt to install Monero miner on your PC, you should remove Crypto-Loot from the system to prevent PC's resources from leaking. For this purpose, you should use a professional anti-malware utility, such as Reimage, Malwarebytes MalwarebytesCombo Cleaner or Plumbytes Anti-MalwareMalwarebytes Malwarebytes. It's not illegal to mine digital currency on your website by using visitor's CPU during the web browsing session. Staying on the mining-inclinded domain from 5 minutes to 2 hours will not cause severe damage to the system. They can create fake websites and promote them with the help of browser hijackers. Once the victim clicks on a link to a malicious website, he or she is exposed to a doubtful website on a new tab URL, which usually locks the screen and reports a malicious activity, urges to install updates/apps to proceed with the browsing, and so on. That's a catch to maximize the collection of Monero fractions. Legitimate websites can also be hacked for mining cryptocurrency. In this cases, the rights of both the domain's owner and its visitor's rights are violations by not letting them known about the usage of crypto-miner. Last, but not least, people might notice a significant increment of CPU resource consumption after the installation of freeware. JacaScript code can be attached to freeware and shareware as a constituent part and activated once the freeware is installed. Although developers of cryptocurrency miner services often claim that the service and related apps are committed by anti-virus tools and adblockers, reputable security tools are usually set to notify PCs' users about an attempt to install mining Trojans stealthily. Crypto-Loot service is similar to Coinhive, CoinImp and CPU Miner. All of them are considered to be legitimate services, but due to the high risk of being exploited for illegal purposes belong to the potentially unwanted program (PUP) category. Crypto-Loot.com Miner Trojan. It's yet another altered version of the Crypto-Loot Trojan. Its removal is highly recommended to protect your PC from high CPU and GPU consumption. Its presence can also result in your web browser's CPU consumption reaching up to 100%. The miner is also related to the ctrl.js Monero library. 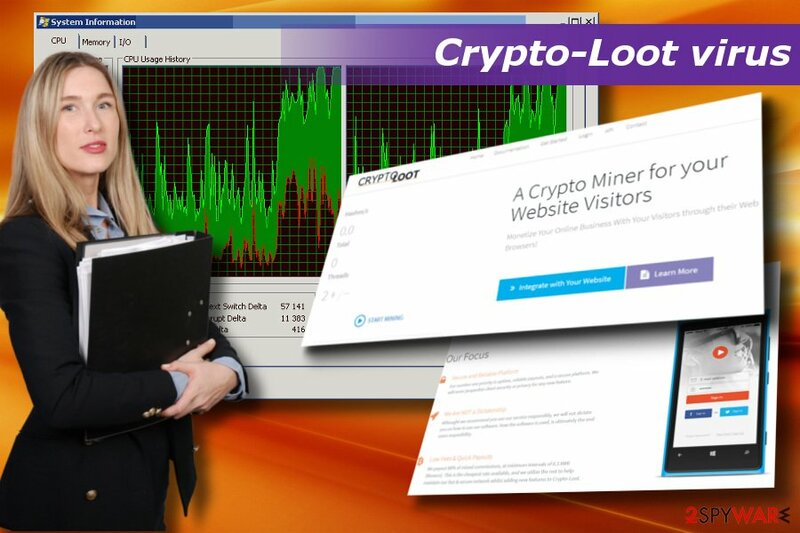 Although cryptocurrency miners exhibit low danger level if compared to Spyware, Ransomware, Keylogger, and similar cyber threats, they are capable of evading detection and removal. The prolonged presence of miner poses a risk for your PC to run into severe software and hardware-related crashes. Note that outdated or questionable anti-malware programs can miss Crypto-Loot miner virus unnoticed. Therefore, if you noticed that the system runs slower than it used to before and most of the apps became unresponsive, we would highly recommend you to open Task Manager and check what processes and programs are using too much CPU. If some of them, including the web browser, takes up more than 50% of CPU, there's a high risk of mining Trojan to be installed. To remove Crypto-Loot from the system, you should run a full system scan with Reimage, Malwarebytes MalwarebytesCombo Cleaner or Plumbytes Anti-MalwareMalwarebytes Malwarebytes anti-malware tools. That should be sufficient to eliminate misleading apps, crypto-miners, and related components. ^ Alec Champaign. Is it worth it to start mining Monero?. How to Mine. Endeavor to make mining cryptocurrency accessible to all. ^ Dieviren. Dieviren. German security news site. ^ Trojan turns your PC into Bitcoin mining slave. Wired. Technology-related news site. ^ Iain Thomson. Another day, another cryptocurrency miner lurking in a Google Chrome extension. The Register. Independent news and views for the tech community. This entry was posted on 2019-04-01 at 01:35 and is filed under Malware, Viruses. You can quickly scan the QR code with your mobile device and have Crypto-Loot virus manual removal instructions right in your pocket. How did you remove Crypto-Loot virus?